Nowadays it is quite common to have sophisticated in-dash GPS (Global Positioning System) installed in the vehicle. While it helps to show the direction route that simplify the life, but at the same time it also posts some safety issues if users are too diverted to the tiny device’s display screen. That is how the next generation GPS is so unique about. Named as HG400, it is capable of beaming the compass and speed settings on the windscreen, so that drivers can fully concentrate while driving on the road. Without complicated installation required, HG400 can sit well on your car dashboard and conveniently project the necessary information onto your windscreen for viewing pleasure. 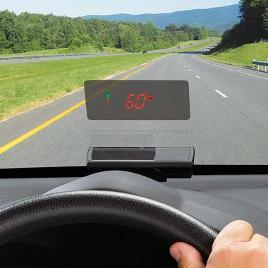 Similar to other GPS-enabled device, it can alert drivers in case they hit speeding limit and good thing is, the device is Bluetooth capable and so it works great with your smartphone and mobile device seamlessly. Just simply plug the charging cable into cigarette lighter slot and you are ready to go. The device is already available for sale and priced at $149.95, it is quite a good deal if users don’t need sophisticated device functionality but emphasizes more on safety while on the move.